Ring News 24Boxing News Breaking Boxing NewsCan anyone survive 12 rounds with Anthony Joshua? 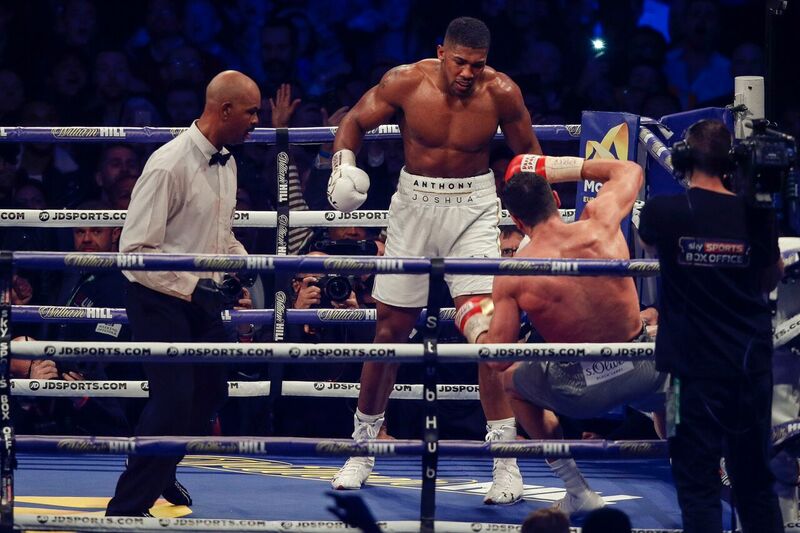 Blowing away opponents has become somewhat of a forte for Anthony Joshua. 20 opponents have tried and 20 have failed to hear the final bell, although most recently Wladimir Klitschko lost after a humdinger of a battle and Carlos Takam was unlucky to be stopped under the circumstances. Fight fans are now asking the question, can anyone last the distance with the heavy-handed London puncher? One person who would stand a great chance is Tyson Fury. It’s becoming increasingly harder to mention the big Manchester heavy when discussing serious fights in the sport’s glamour division. Will Fury definitely return to the ring in 2018? He’s now hooked up with Frank Warren and is actively seeking a British license but it feels like we have been through this before, albeit with not so much concrete evidence of a plan it has to be said. If he does come back and punch his way back up to the top then he certainly has the size and ring smarts to take Joshua’s big shots and not only last the distance but defeat Eddie Hearn’s prize asset. Fury recently intimated that he wishes to fight Joshua without any warm up bouts, which, if true, would scream of a cash out. Despite showing vulnerabilities in past fights, Tyson is sturdy enough when focused and on form, as he showed against Wladimir Klitschko when he displayed 12 rounds of switched-on boxing, away from home. It’s been against lesser opponents that Fury has been dropped and hurt in the past. Steve Cunningham -who is now campaigning back down at cruiserweight- dropped the big man on his American debut and Neven Pajkic had him wobbled and stumbling back in their 2011 bout on Channel 5. One fight before that, Fury was also hurt in Belfast by Nicolai Firtha in a rousing fire fight. I was ringside for that bout and it represented an exciting time in Fury’s career. If he can regroup, shed the ring rust and recapture the form he was showing before his hiatus then he can grab, hold and ‘drown’ big AJ over the distance. Alexander Povetkin is also capable of competing over a distance and has gone the 12-round distance in his last two fights. It’s hard to assess Povetkin now, given that he has a strong history of PED usage. When he was blasting out the likes of Mike Perez so impressively, was he displaying genuine power or was he being “assisted”? There’s no doubt Povetkin can bang a bit but can he thump hard enough to make a dent in the new breed of fresh young heavyweights on the scene? Now aged 38, Povetkin has always displayed a fairly solid beard over the years and showed his durability in his only career defeat on record, in 2013, when Wladimir Klitschko dropped him numerous times in a dour affair in Russia. If Joshua adopted similar tactics to Wlad then it’s hard to see Povetkin enjoying any great success, but he may be able to absorb the big shots for long enough to frustrate Joshua who tends to tire after the midpoint in fights. Other than that it’s relatively difficult to find a heavyweight that could last the course with AJ. Until recently I’d have said that a big unit like Marius Wach could potentially absorb the big bombs but he looked terrible in a recent stoppage loss to Jerrell Miller and was also stopped by the aforementioned Povetkin so the chin has been well and truly cracked. Dominic Breazeale is a durable enough character and took his lumps against Joshua but eventually caved in under pressure. Could the blockbuster unification between Joshua and Deontay Wilder last the distance, with both men using boxing tactics to avoid each other’s power? This sport has a way of throwing up some odd results but I’d be mightily surprised if we heard the scorecards in that one.